Sorry for the bad picture, but you get the idea that these are some very good brownies. This morning at 11 am, the first legal marijuana store in Vancouver, Washington will open its doors to the public. If you find yourself in a celebrating mood, just put the instant brownie box back on the shelf and make yourself a batch of Good Brownies. 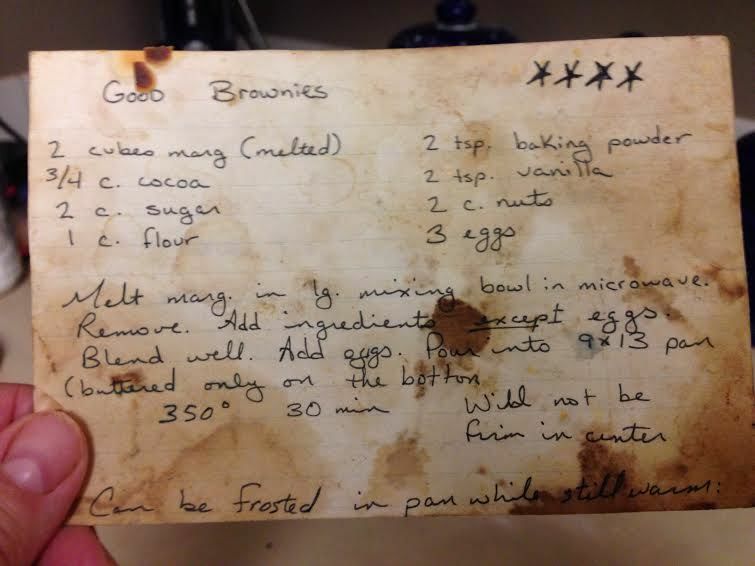 These are the first brownies that I learned to make in grade school. I don’t remember where the recipe originated, but it’s delicious. Over the years, I’ve tried adding various ingredients into the batter like M&M’s, dried fruit, cream cheese, and peanut butter. They were all satisfying. And I usually skip the frosting unless I’m really craving rich chocolaty goodness. Or whip up a batch of peanut butter frosting. It’s your call. Melt butter in a large mixing bowl in the microwave. Remove. Add all the ingredients except for the eggs. Blend well. Add eggs. Pour into a 9 X 13 pan that is buttered only on the bottom. Bake for 30 minutes in a 350-degree oven. They will not be firm in the center when you take them out of the oven. They can be frosted in the pan while they’re still warm. *Marijuana butter is an easy addition. Here’s a link to a recipe at The Weed Blog.